These are photos of different pigments in their natural ground up state. I've never ever seen a display of pigments like this before. The photos are from the shop where I bought my shopping trolley on the Tuesday afternoon. The photo on the left is the shop window and the one above is of the jars of pigment inside of the shop. Ella (new painting buddy) then took me to visit one of her very favourite places - the shop of Livio de Marchi. He is an artist who sculpts the most amazing everyday items in wood. You can see a number of examples in this gallery on his website. I bought some wooden pears - quite unlike any I've ever seen before. This is a photo of him standing at the door to his job. The hat is wooden! 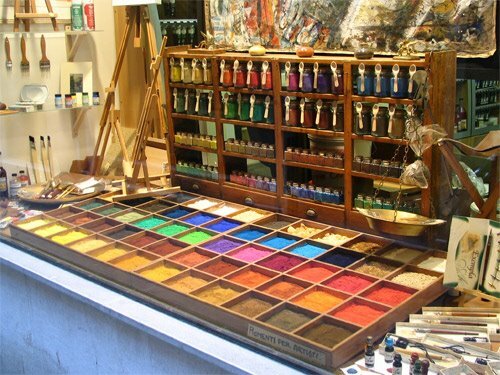 Pigment shop: Arcobaleno Pigmenti de Nube Massimo, San Marco - Venezia. Katherine, thanks so much for sharing your adventures - I'm living vicariously through you. 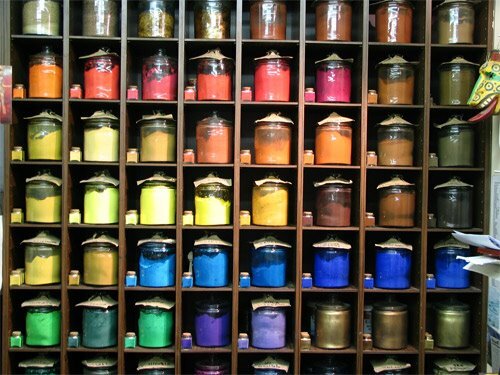 I must tell you I am completely mesmerized by the photos of the pigments! I would have been rooted to the spot had I been there in person to see them myself. Good luck on the Southwestern trip! Just wanted to thank you for posting sucn great information (as well as all the lovely art and travel) on your blog. 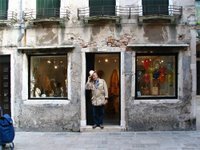 I was in Venice a couple of years back and passed that art supply shop one time then could never find it again. Your posting put me on the trail again and now, armed with a map reference, I plan to find it when I am there again in January. I also loved the piece about sketching the waiters in a restaurant and attracting interest as you went - having had a similar experience.